I cannot place the xylophone, it says its locked/ limited item, what do I do? You will have this problem if you try and place it from the new items tab, look in your inventory instead to be able to place the xylophone in one of your sims houses. After the time has passed come back and click the exclamation mark above your sims head to find one of the musical expression collectibles. Every time your sim finishes playing the xylophone their musical expression hobby skill level up percentage will increase, once they reach 100% they will level up, there are 6 levels. You need to reach level 6 to be able to unlock all of the musical expression collectibles, once unlocked you will be able to find them. Musical Virtuoso Piano Concerto No.21 and Etude in C Minor are now unlocked in the hobby collection. 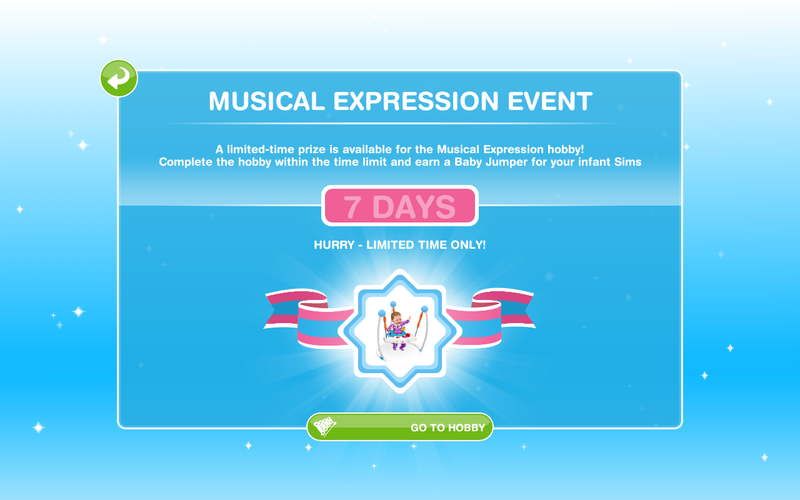 Time Limited Hobby Events– the musical expression hobby appears in these events, to complete these you have to complete the musical expression hobby a certain amount of times during the time limit to unlock all of the prizes, you can find a list of time limited hobby events here. If you want to complete these time limited hobby events then have one sim get to level six in this hobby before the next event starts to be in with the chance of completing it! Is anyone else having an awful time getting a baby to level six before they age up to toddler? I have had a baby doing this since the minute they were created but they still age before they’ve done it enough times to unlock the last two songs! I even tried using lp to speed up the 6 1/2 hours but it just made the baby age faster. I’ve give through four babies already and there just isn’t time. How did you manage to complete it? I completed it on my game where I haven’t complete the life dreams quest or I don’t think I would have been able to do it! I used LPs to reverse the age of the baby back to the beginning of the baby stage. Your posts are really helpful. I finally, got the baby Mat after constantly going and refilling the baby’s need meter when it goes down. I just added a ‘baby Sibling’ in the crib to one of my families that has a toddler girl, as soon as that baby comes I can finally age this one, but I will difinitely get the outfits. I am almost done with the finger painting hobby, I only use one toddler for it, but not as stressful. Though, I level up faster than I can keep up with the quests, I am level 23 and I am doing level 15 Quests, and Will the quests stay in the queue until I do them one at a time? Some discovery quests if I don’t think I can finish in time then I choose not to do it, like I haven’t done the salsa dancing one, and since reading the post it did not interest me to do it. I just finished the Nanny Knows Best quest, and just started the Musical Expression hobby. But I get back on the game today, and it tells me I’ve run out of time to get the baby jumper! I just finished the quest yesterday!! What happened?! Awesome! Got a new, awesome song: Hot Cross Buns. I just set my Infant Sim to Play Xylophone again, I hope this time I get a new song too! I love your blog it really helps and I refer to it quite regularly. Is there a time limit for the outfits? hi, questions… i didn’t complete the quest in 7 days cause i didn’t have time to play. i got the xylophone & the play mat but no bouncer 😦 do you know if there’s any way i can still get it?? No sorry, you needed to complete the hobby in the time limit to get the bouncer. I am on this quest, and I have played the xylophone 5 times but the other hobby chart it shows I’ve only played 3 songs. Since the third time my infant has played the xylophone it just says it sounds much better the second time I play it. Am I doing this right? You won’t find a new one each time you play it, you have only got 3 new songs but played it 5 times so you got 2 that were the same, just keep going because you are doing it right! This is probably my least favorite hobby.. Thank you for your great blog though, it helps a lot! For some reason, after completing the nanny quest in time, I cannot find the xylophone at the kids store. Help!! everyone time I click on the xylophone for my baby to play the baby just shakes his head and won’t play it. I’m really confused on why he won’t do it and I even moved the xylophone to the center of the room. Is the baby on the floor? 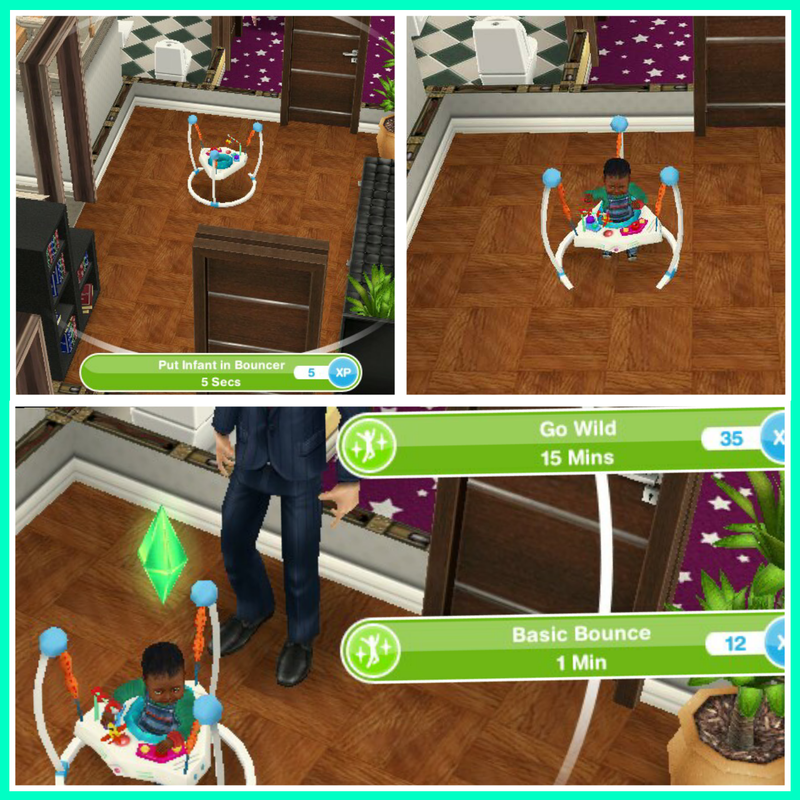 You need to get the adult to pick the baby up then select let them crawl so the baby is on the floor then you can click on the xylophone to use it. Just to be sure.. If I don’t complete this quest in time, I will not get the bouncer. I can still get the outfits though, even if I didn’t make the quest in time. Right? 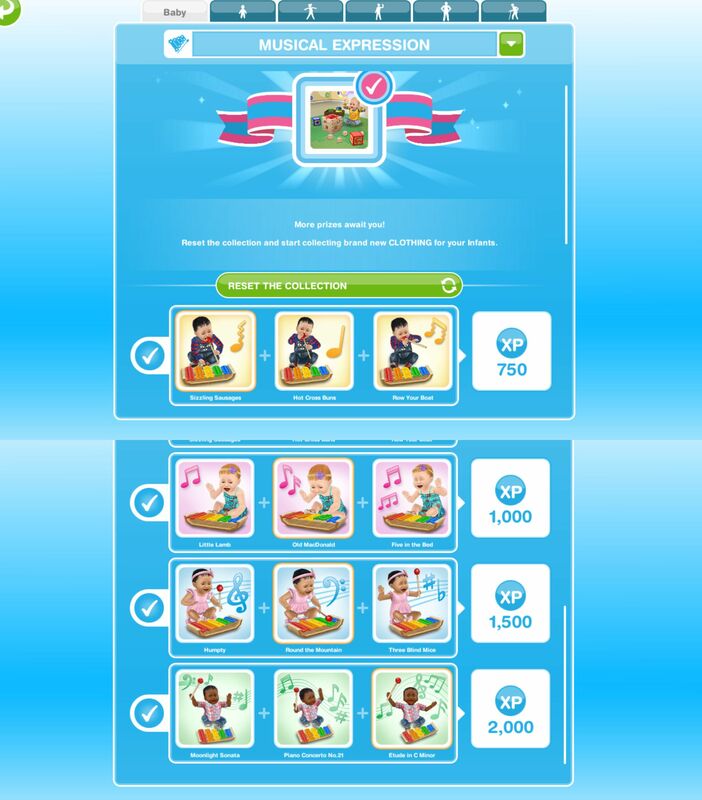 I completed musical expressions in time and got the prizes. But had no idea . I had to do it again to get infant clothes. So I didn’t reset it. Now the chart is gone. What do I do?? I have the babies playing but no chart. I really want the infants clothes what can I do? My baby is on the floor just right next to the zylophone. Just shakes his head, wont play it. Annoying! Help!! Have you tried rotating the xylophone? Maybe they can’t access the front of it? Is the infant bouncer worthy to get? Personally I like it, but that is just my opinion! You need to complete the whole hobby collection (find all 12 songs) for the first time before more than one baby can do this hobby. Should u be able to pick the pair outfits you want? I want all them but there one or two I want before the rest…. My baby won’t play the xylophone. Have you tried moving it into the middle of a room so they can access it? Just so you know with the new update the time for the hobby is now 3 hours 15 minutes! Can a toddler play the xylophone? I haven’t finished the birthday cake yet but it’s gonna finish soon. Should I just let my sim, who baked the cake, stand there and wait for the quest to finish before celebrating the birthday? No, only babies can do this hobby. I just wanna ask, is there any other hobby babies can do beside playing xylophone? No, that is the only hobby for babies at this time. I started the musical hobbies quest last night and when I opened my Sims this morning it said that I’ve already ruin out of time to complete the quest. Three must have been a glitch. Is there anything I can do ? I lost all my music collection tonight and i dont know why. I still have 5 days to finish the quest. And one more thing, the first gifts i saw were bouncer and toys but now it turned into baby onesie event. I needed one more song to finish it, and then it automatically deleted everything for the baby onesie eventDo you think everything will be back again after the event? my musical exression quest is missing when the baby onesie event started. I clicked yes on the onsies quest and the musical expressions quest vanished.. Would you know if I would still get the bouncer if I completed it before 7 days? Sigh….. I don’t know what to do. My baby won’t play the xylophone. It says incorrect age group idk what to do please help! Is the plumbob (green symbol over your sims head) on the baby and not someone else in the house? Do you have a google+/ google play games account? As that is the only way I can add on my android as I no longer have a gaming facebook account. Yes I have. How can I add you thru google play games? I’m stuck in the social goal where I should use my neighbor’s fire pole. I can’t find any fire pole in the neighborhood. I will add you but I don’t actually have a fire pole yet, I am still trying to rebuild my town after I lost my whole game. Oh okay. Hope to see you soon in my party boat 🙂 my party boat’s having some issues though, they won’t show some neighbors I’ve added. Give it some time and they should appear. Okay. Thanks for answering! ❤ Btw, since the event is coming soon, has the Outdoors Event appeared on Sims before? I can not find the xylophone in the inventory and I completed the nanny quest. What do I do? You need to buy it from the promotions r us store first then you will be able to find it in the hobby section of your inventory. Important sims are the ones with question marks in the bubbles above their heads. Do i have to do the musical expression ?? Or can i skip it or choose to not do it? Is it mandatory? You can choose not to do it, it will just be an incomplete hobby. Thanks for all your advice and tips. I have a question: I’m confused about the toddler girls’ clothes. Some new outfits come with scarves around the neck (a style I hate even in real life), but some new outfits include plaid or floral dresses, which I love. If I put my babies to re-start the Musical Expression hobby, which style will I get? Or will I get both styles? You are talking about the clothes you win in the finger painting hobby: https://thegirlwhogames.wordpress.com/2015/08/23/the-sims-freeplay-hobbies-finger-painting/ those outfits are the ones with the scarfs, completing the musical expressions hobby will unlock the baby outfits shown in this post you are commenting on. I have to take a break from the game for a couple of days. Is there any way to pause the quests w/out loosing the prizes like the musical expression. I 💖 your blog. Thank you! No, time quests and hobbies cannot be paused unfortunately. Thanks and you’re welcome! Yessss! Thanks to your blog I managed to complete the Nanny Knows Best quest in the time limit (so I got the overalls) AND I managed to get the baby bouncer with five hours to spare (Whew) Is there any chance you could add me to your party boat and I could add you to mine? I’ve visited the neighbours needed post and added a few but I would love love love to be your neighbour. You’re my Sim Freeplay Idol lol!!! Also is the In Da Clubhouse trike worth it? It seems cute and all but I just want to know if it’s worth me saving my LPs for. Correction my 2 LPs for. Do you have any tricks for someone with 10 sims (counting 2 babies) on how to get LPs? 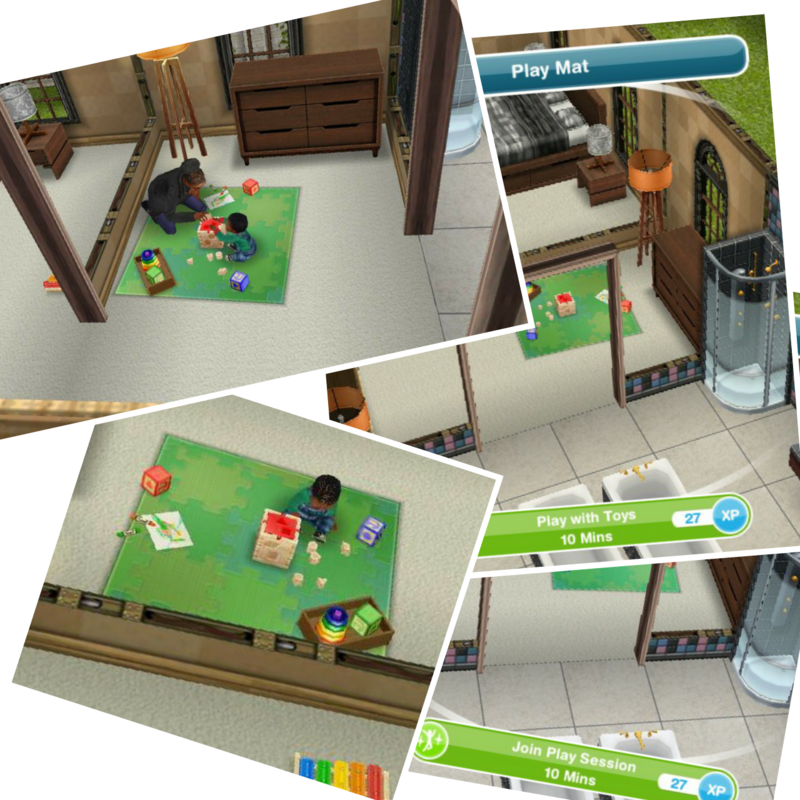 Anyway, thanks so much for your lovely blog, it’s my go to for anythings Sims Freeplay! It depends what device you are playing on and what method you are using to add neighbours as I cannot add on game center or facebook, I can only add via google+ right now, sorry! I have no plans for another competition just yet but I will start thinking about it for sometime in the future! I am replying to your other comment on this one as you didn’t want me to post your Google+ name. Hello again! I searched your name ‘The Girl Who Games’ but it wouldn’t come up??? So just to be sure, your name is The Girl Who Games right? Anyway thanks very much! Any idea if there will be another chance to get the baby bouncer? I missed it by 1 song (I got the last song less than 1 hour after the time limit ended)! Sorry if you didn’t complete it in the time limit you cannot get the baby bouncer. Hi. I can’t get the xylophone. I have bought the to my home store, but there it says, that I its locked and a limeted object. I have lokkede in all my houses for it (if I bought it in an axident) but no. Do you know what to do??? 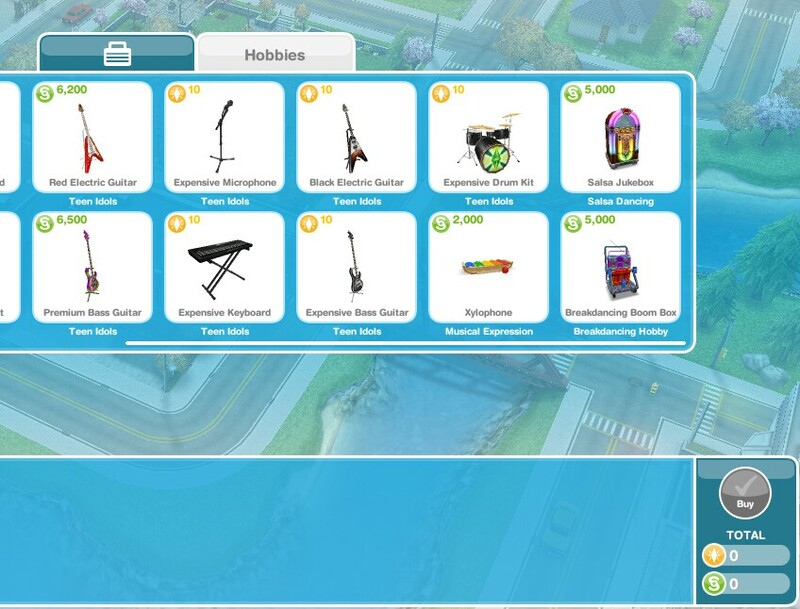 You will get this issue if you are in the new items tab, if you go to the hobby and career items tab of your inventory you should be able to place the xylophone. Because of this blog I started this event right after the Nanny knows best quest and finished under 5 hours. I just had 5 sims cooking and saved up 50 LP’s and sped up the task. That’s great and you’re welcome! My baby sims can’t evolve into a toddler even though the quest is 1st in my queue and unlocked but I still can’t start the quest. I’m a level 14 so what is the problem? I don’t have many other quests going on but I still can’t start it. weightlessmagic, I am such a fool, when will I learn to chill XD I wanted to move a xylophone to a different house, because I aged up a baby there and had another one ready at a different house, but couldn’t find it in the infant section of the inventory. Did all the diy things like leaving and returning to the game, changing houses, all that. Even tried storing another xylophone, just to see if it would ‘wake up’ the inventory, so to speak, but it didn’t. ‘Okay, maybe I accidentaly hit sell instead of store?’, but nope, PrU store said I already had the maximum. I was about to panic when I thought ‘that’s a hobby item, maybe it’s in the hobbies section?’. Boom, there they were, exactly where they were supposed to be. I don’t know whether to laugh or facepalm at my stupidity. Possibly both. Oh well, all’s well that ends well. BTW, congratulations on your amazing blog, I follow it religiously to plan all the quest and hobby things. Keep being great!